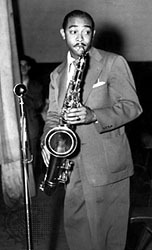 Carlos Wesley "Don" Byas was a key player in the transition from swing to Bebop and became one of the best known tenor sax players during the mid-1940s. He was born in Oklahoma in 1912 and played in many important bands during the 1930s, such as Andy Kirk's, and Duke Ellington's band. In 1941, he replaced Lester Young in Count Basie's band and recorded a famous solo on the song Harvard Blues. In 1943, he left Basie's band and became a regular at the New York clubs, playing in a 2-tenor group with Coleman Hawkins. He later joined Dizzie Gillepsie's group, where his knowledge of harmony allowed him to combine his own style with the new ideas being explored during the day (bebop). In 1945, he made one of my favorite recordings of I got Rhythm. He and bassist "Slam" Stewart were the only performers who ended up showing up at a Town Hall concert, so they went on stage and played the duet. Stewart uses Hawkins' full sound, yet utilizes the ideas being explored by the likes of Gillespie and Charlie Parker. The result is superb! In 1946, he left the States and joined Don Redman on a European tour and settled there until he died of lung cancer in 1972.